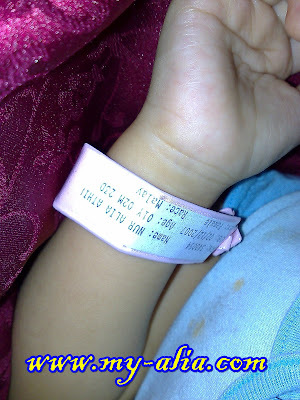 As promised, here is my story of Alia's admittance at the Ampang Puteri Specialist Hospital last Wednesday. On Wednesday (from the entry Battle of The Sexes) I wrote that Mr hubby was at home, taking care of Alia, meanwhile I was at the office, working. At noon (around 12 pm), I got a call from Mr hubby, requesting me to get home as soon as possible because Alia’s runny nose was suddenly so unbearable. So, I drove home. And we have decided to go to Ampang Puteri (because it was the nearest hospital and we can reach there in 10 minutes time). Went to Emergency. Met the Doctor in charge. She said Alia was wheezing and she needed to go for a round of nebulizer. We took Alia to the Athma Bay and had her neb treatment. Went to see Dr again. Dr said her wheezing was quite rigorous. Dr advised us to admit Alia. We asked her if there’s any other alternative, but she said no. So, I had to ‘berkampung’ those 4 days and 3 nights there. Erm.. taking care of sick child at hospital has never been my favorite. So during Alia’s stay at the hospital, among her treatments are medication (oh, they taught me the easiest way to feed her oral medication!) and also she was sent to Physiotherapist twice a day (for suction). Alhamdulillah, it was an “ok” experience for me. 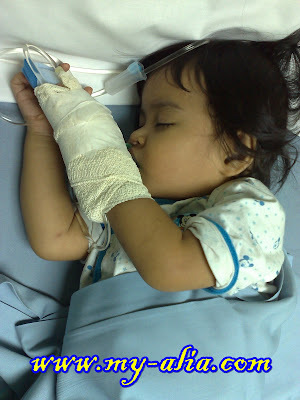 Although last time Alia was admitted, it was around August 2008 (and she was 8 month old at that time), and compared to this one, last time was a rather hectic, tired one, because she was at “lasak” stage. Haha..
Ok, i guess, that’s all. 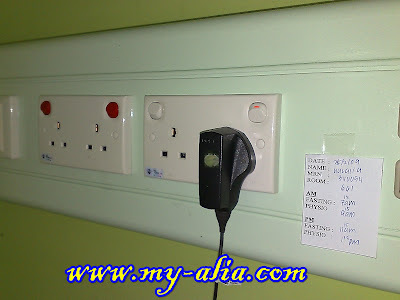 **Although we only need to pay RM700.00 from the total hospital charge (that was RM3,300) I still feel that it was quite expensive.. hmmm.. maybe next time we’ll try half-private half-government hospital like HUKM or PPUM. Hihi..
hehe... ada la... haha.. nanti saya buat satu entry ya! hehe.. ramai nak tau rupanya.. ok, insya Allah. Salam perkenalan..i am leaving this comment coz i guess we shared the same experience; ada anak yang ada athma..my eldest son pon pernah admitted 2 days coz of da same reason..asal salah makan sket mesti kena "serang" and naseb klinik dekat umah ade sediakan nebulizer so just hantar kat situ jer tapi xsahlah kalo xberhabis ratusan ringgit ntok dia sorang..